Components are the major building blocks of an Angular application. When building a complex application like a dashboard, we may have more than one components bootstrapped to the UI. In this case, a common requirement is to send data from one component to another component without having any direct relationship between them. Angular provides @Input and @Output decorators where the parent component can send data to the child component using the property decorated with @Input decorator inside the child component. However in this approach, the HTML template of the child component must be rendered through the HTML template of the parent component. I have already written an article about this approach over here www.dotnetcurry.com/angularjs/1323/angular2-passing-data-master-detail-component. In this article, we will discuss another approach to implement communication across components without using @Input and @Output decorators. We will be implementing this approach using Angular Services. Angular services contain logic that is independent of the components. These services can be used in multiple components. Generally, these services are used to make an external call using HTTP to REST APIs or they can also be used to perform Socket communication or for that matter, any logic that is independent of the view of the components. In our case, we will use services which will act as a bridge between two components so that one component can send the data and the second component can accept it using services and processes it. ­As shown in the above diagram, we have a sender component, receiver component, and the Angular service. This service will define parameters, an EventEmitter object and a method. This object will be used by receiver component to subscribe to an event. The method defined in the service will accept the parameter, this method will be called by the sender component. This method will then emit the event by passing the received parameter to it. Since the receiver component has already subscribed to the EventEmitter object, the service will notify the received parameter from the sender component to the receiver component. To implement the application, I have used Visual Studio Code (VSCode) and WebPack Module-Loader. You can also use Angular CLI. The source-code of the article can be downloaded to understand configurations in package.json and the webpack.config.js file. 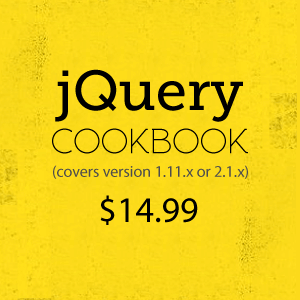 As shown in the above image, the config folder contains utility.js. This file contains node.js module for resolving file paths. 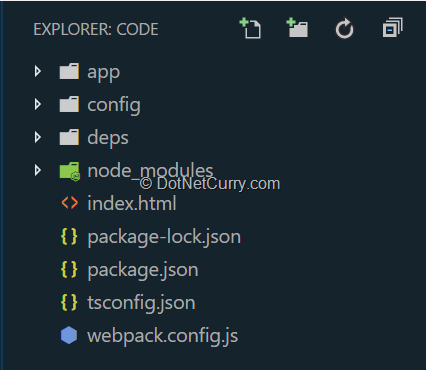 This module is used in the webpack.config.js to resolve file paths for the application. The deps folder contains polyfills.ts and stdpkgs.ts. These files contain code for zone.js configuration and imports for all standard Angular packages respectively. The app folder contains all the application code files. The webpack.config.js file contains code for reading all source files and files from the deps folder. The module loaders are managed by this file. The above code defines Category class with required properties and Categories array with default data. The above code defines Product class with required properties and Products array with default data. 1. The id member variable is declared in the service class. The value for this member will be set by the sender component. The receivedFilter member of the type EventEmitter is declared. This event can be subscribed by some other object. In our case, the subscriber will be receiver component. This will emit the value received for id member to the subscriber i.e. the receiver component. 2. The raiseEvent() method will accept a parameter. This method will be called by the sender component. The sender component will pass value to this method. The method will accept parameter and will emit the receivedFilter event by passing parameter to it. The above code defines CategorySenderComponent which has the most important getSelectedCategory() method. The getSelectedCategory() method makes a call to the raiseEvent() method of the service class. The getSelectedCategory() method is bound with the table row of HTML table using click event binding. When the row is clicked, the Category object is passed to the getSelectedCategory() method. This method reads CatId from the Category object and passes it to the raiseEvent() method. 1. The above code has the following important specifications. The ngOnInit() method subscribes to the receivedFilter event from the service and receives the parameter from it. The value from the parameter is set to the CatId declared in the component. 2. The FilterProducts() is a read-only property. This property will be invoked when the component is updated based on the change in the value of the CatId member. This read-only property will then iterate over the prds array and read all products based on the CatId. The FilterProducts() is bound with the HTML table to generate rows dynamically. If no match is found, it will return all products. The above code defines angular bootstrapping code. The code imports required Angular standard modules, the components and service created Step 2. 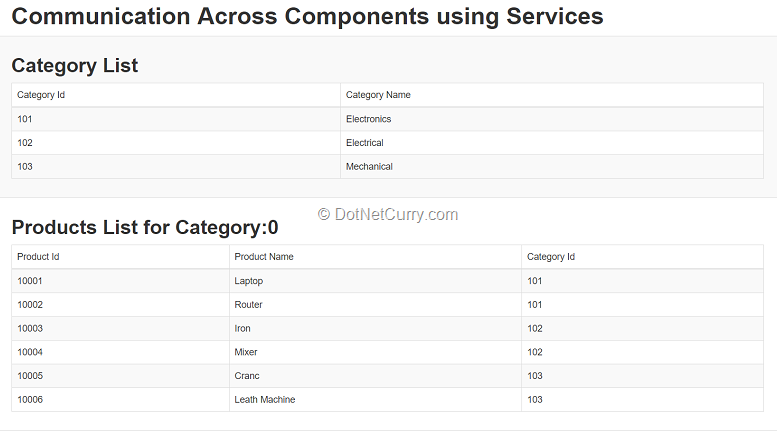 The CommunicationService is defined in the providers array of the Angular module and the CategorySenderComponent and ProductReceiverComponent are defined as bootstrap components. Step 4: We have index.html on the root of the workspace. Add the following mark-up in this file. The above mark-up uses selectors from the CategorySenderComponent and ProductReceiverComponent. This will run the application. In this tutorial we saw how Angular services can be used to communicate data across components using Event Subscription and Notifications.